^ Tournadre N. (2008). “Arguments against the Concept of ‘Conjunct’/‘Disjunct’ in Tibetan”. In B. Huber, M. Volkart, P. Widmer, P. Schwieger (pdf). Chomolangma, Demawend , Kasbek: Festschrift für Roland Bielmeier zu seinem 65. Geburtstag. 1. pp. 281–308. http://www.nicolas-tournadre.net/wp-content/uploads/2014/07/2008-Conjunct.pdf. ^ Chirkova, Katia (2008). “On the position of Báimǎ within Tibetan”. In Lubotsky et al.. Evidence and Counter-Evidence. 2. ^ Tournadre, Nicolas (2013). “The Tibetic languages and their classification”. In Hill, Nathan W.; Owen-Smith, Thomas. Trans-Himalayan Linguistics: Historical and Descriptive Linguistics of the Himalayan Area. De Gruyter Mouton. pp. 105-129. http://glottolog.org/resource/languoid/id/tibe1276. Denwood, Philip (2007). 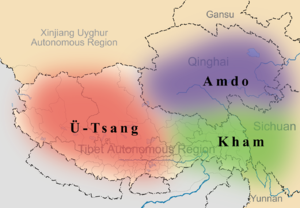 “The Language History of Tibetan”. In Roland Bielmeier, Felix Haller. Linguistics of the Himalayas and beyond. Walter de Gruyter. pp. 47–70. ISBN 3-11-019828-2.